Ms. Jen-Hui Tsai was born in 1944, as the 6th child of her parents in Kaohsiung, a city in southern Taiwan. From 1970 to 1978, she got married, and studied, with her husband, at the University of Illinois Urbana-Champaign. She earned a M.Ed. in Special Education, majoring in emotional disturbed children and counseling. From 1977 to 1979, she gave birth to her two children, a daughter and a son. She became a grandmother when my first grandson was born in 2012. 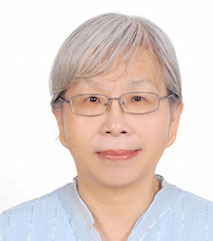 During the period of 1985 to 2006, Ms. Jen-Hui Tsai taught at National Taipei University of Technology (NTUT), and also served as the Director of the Student Counseling Center. In 2006 she retired. As a devout Buddhist since 1990, I was blessed and brave enough in 2008 to accept a significant mission---to establish and be in charge of training the volunteers of The Care Life Line for Dharma Drum Mountain Humanity and Society Foundation. On behalf of the Foundation, from 2011to 2015, I designed and carried out a three level Life Education course for correction professional workers for the Agency of Corrections of the Ministry of Justice. For the first two books, I invited the authors to Taiwan in 2013. They presented six workshops, and I served as the interpreter. At present, in 2017, I am healthy and at peace as a wife-mother-grandmother. Most of all, I am practicing to be blessed with mindful wisdom as a Buddhist.